I haven’t written in my blog in a long time. A lot has happened in my life. I am a father now. Melissa gave birth to our son Logan. We are happy and grateful for the miracle of his life. Seeing his smiles and his curiosity for the world brings us great joy. The reason I started this blog was to write as a way to grow. I wanted to be able to explore ideas about faith, life, and my various interests. Instead of turning thoughts over and over in my head, I wanted to write them down and share them with others. I hoped that this process would test the ideas, that others might provide me feedback, and finally that my experiences could be useful to others. But it turned out that I was not ready. My heart and mind called me to question the core of my faith as a Catholic Christian. I entered this journey in fits and starts and found that I was not dealing with ideas anymore but people. My faith is part of my identity and is wound up in my relationships. I think of my mom and dad who taught me to pray the rosary, my friends from the Catholic Center at Rutgers who I sang and prayed with during retreats, my non-Catholic friends who respected my commitment to my faith, and finally my wife who built with me our relationship on the foundation of our faith. Through all of this there is the person of Jesus. How could I describe my beliefs publicly when I was not even sure myself? I felt that my ideas were taking me outside of the Catholic beliefs, and even Christian beliefs in general. My movement in my beliefs seemed to tear at my relationships. I needed time for the movement inside me to develop before I revealed it to the public. My last blog post related to religion was in January 2015. At the time I was going to a spiritual director who recommended that I read The Phenomenon of Man, by Pierre Teilhard de Chardin the Jesuit priest and paleontologist. Reading that book in November 2015, really set me in motion. I loved that Chardin felt that science and religion overlap (as opposed to people who argue that each can only say things in its own “sphere”). I was fascinated by the idea that everything in nature has an “inner”, or spiritual, and an “outer”, or physical, aspect. As someone who loves the physical world, from the motion of atoms to playing with a dog outside, this was deeply reassuring. But Chardin’s ideas propelled me to continue to ask hard questions about my faith. In 2016 the beliefs that I had known were unravelling. I had come to accept that biological evolution had profound implications for theology, especially after reading Ilia Delio’s book The Unbearable Wholeness of Being. I had started to question the doctrines of Original Sin and the Immaculate Conception of Mary in 2015, but in 2016 I rejected them. This led to a cascade of other Catholic beliefs that I began to question or reject. One of the admirable things about the Catholic faith in particular is the specificity of its claims. But if one part is false, then it all starts to fall apart. Even the central story of salvation, Jesus becoming human to redeem us, did not make sense without Original Sin. This change in my beliefs created tension. In the spring of that year, I led a men’s Cornerstone retreat along with two of my friends. I was actively going to church and receiving communion. I was seeing a spiritual director. I wanted to keep my faith. But at the same time, I was coming to terms with the reality that I no longer “doubted” these aspects of the Catholic faith, but I actually did not believe in them. I felt lost and alone. Mass became agonizing. Politics was one of the catalysts that prompted me to take concrete steps away from my old faith. In November 2016, Donald Trump was elected president, and I abhorred his message which attacked immigrants, muslims, a free press, the environment, and others. I was shocked at how many Catholics voted for Donald Trump (but I should remember that a vote does not mean unequivocal support of Trump’s message). Political arguments with family led to religious arguments, and I realized that I needed to integrate my new ideas and beliefs into who I am. In 2017, I started to make changes. In January, I spoke with our pastor about how I was struggling with key parts of the Catholic faith, even the divinity of Jesus. I felt that I should stop going to communion. Our pastor encouraged me to continue searching for truth but felt that I could continue receiving communion. In the spring, I stopped going to communion. I couldn’t honestly say “Amen” when the priest says, “the body of Christ”. I also stopped going to spiritual direction shortly after that. These may seem like small things, but for me they felt like uprooting a core part of my life. I began to speak to family members and close friends about the changes in my faith. Each time was nerve-racking because it felt a little like I was turning my back on on our shared Catholic identity. Mostly the conversations went well. People did not always understand, but they tended to respect that I am honestly trying to pursue the truth. Some hold on to hope that my exploration will bring me back to orthodox Catholic teachings. I hope that the orthodox teachings change dramatically so that I can wholeheartedly say Amen to them! I feel a passion to learn more about how evolution and faith can go together. 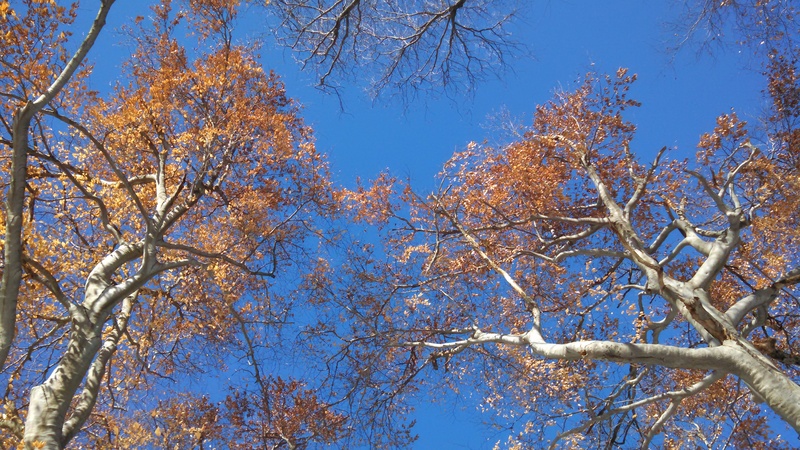 I feel a sense of awe that I am part of this billions of year old tree of life. I believe that somehow God is growing as the world develops. We are part of a divine and earthy story! Just because the world is natural does not mean that it is perfect or complete. I see things that don’t seem right in the world, most clearly in humans. We have the tendency to be short-sighted, selfish, and mean. But outside of humans, and whether it is good or bad, the world also can be a brutal place. I’m thinking of cats playing with baby rabbits before they kill them or brain eating parasites. In coming to terms with this reality, I have diverged from orthodox Catholic teaching. In Catholicism the evil and brutality of the world is explained by the doctrine of Original Sin. According to this doctrine, humans at some point, traditionally with Adam and Eve, chose to rely on themselves rather than on God. Their distrust cut them off from God’s goodness and brought suffering on the whole human race and even the whole world. So according to the doctrine of Original Sin things were perfect from the start, but humans screwed it up. I can not believe that. I believe in the natural history of evolution, and there was never a time period that was pristine and perfect with no suffering or death. From the first life on earth, every evidence points to struggle and vast amounts of death. There is still suffering and death, but things have at the very least being getting a lot more interesting. So I reject the idea that suffering and death are caused by an ancient human mistake, and instead believe that evil, suffering and death are signs that the world is not complete. We can help to make it better! In Catholicism, and Christianity in general, Jesus came to right that original wrong. This a core belief. So what am I left with if I believe that the world is just incomplete instead of riddled with sin? How do I understand Jesus and his death on the cross? I don’t have the answers to these questions yet. I may spend the rest of my life searching, but I know that I need to move forward from my old beliefs. But my faith is in my heart and not just in my mind. To me God and Jesus are personal not just ideas. So I feel grief when I see a separation between me and the Catholic faith that I knew, and the Jesus whom I love. I can relate to Peter who said “Lord, to whom shall we go? You have words of eternal life” (John 6:68). My faith is a relationship, not something to abandon easily. So I try to hold on to all that is good and true in my Catholic faith, even as I feel joy to be getting to know God in a new way. I hold onto the memory of how God has directly changed my life and look for where He is moving now. So I continue to pray even though I am not always sure how to address God, as Jesus, Lord or God. Melissa, Logan and I go to church on Sundays, and though I refrain from receiving communion, I take part. I still find guidance in the moral teachings of the church even though I look at them from a different perspective, and I am inspired by the saints, good men and women that lived passionately for God and their fellow man. I continue to try to learn by reading posts about faith and science on the Omega Center, and recently by reading a book about the lives of moss (Gathering Moss, by Robin Wall Kimmerer). I believe that God will continue lead me – sometimes in surprising ways!. If you pray, please say a prayer for me that I have the openness to follow where God leads. my reasoning for the changes in my beliefs. If you are curious feel free to ask or comment! This entry was posted in Uncategorized on November 5, 2018 by davidruffner. I was disturbed by the election, so I reached out to people to hear their thoughts. Overwhelmingly, people are frustrated and want change. I found this to be true regardless of who people voted for. This desire for positive change is encouraging. Unfortunately, I believe the president-elect could drag us down instead. He has demonstrated an insecurity and a willingness to lash out at those who speak the truth about him. His weakness makes him especially dangerous holding a job with such great responsibility. I’m looking for ways that we can stand up to this new administration which seems to be gearing up to attack immigrants, to restrict free speech, and to roll back protections for the environment. I found some organizations that are working to move the country in a more positive direction. Two that I’m supporting are the Representation Project (http://therepresentationproject.org/) which fights limiting stereotypes and the Southern Poverty Law Center (https://www.splcenter.org/) which fights hate and bigotry. Please share other ways, especially active ways, that we can resist and work for a more just, inclusive, and positive country. I was thinking that one way that we could move forward is by sharing stories of people who have fought hatred, tyranny, and oppression in the past. I hope to write soon about people that have inspired me. Please share stories about the men and women that you look up to. Maybe these heroes can show us how to take action to ensure that we move forward as a nation. This entry was posted in Uncategorized on December 3, 2016 by davidruffner. Thanksgiving is coming up soon! It’s been around eight months since I last wrote here. I can’t believe how fast the time has gone by. I’ve had some ideas but no time to write. Working at Spheryx has definitely kept me busy. I want to write today about gratitude. It’s a lucky coincidence that Thanksgiving is coming up this week, because the timing for this post was not planned at all. Back in February or March I had read the book, Thanks!, by Robert A. Emmons, and since then I have wanted to write a blog post about being thankful. Today I finally have the chance to write because my boss unexpectedly gave me the day off for my hard work over the past few weeks. In the book, Emmons argues that gratitude makes a positive difference and that we can choose to be grateful. On the one hand it’s obvious; we all know that we should count our blessings. But on the other hand, gratitude can seem impossible on the bad days. Trying to be thankful in adversity can feel like self-deception. The cool thing about this book is that Emmons has the research to back it up. He describes many studies that have shown the power of being grateful on general well being. I like one where he randomly assigned people to three groups which each kept lists on a weekly basis. One kept a list of things they were thankful for, one of hassles they faced, and the third was a control group. At the end of the study the thankful group was happier than the hassle group based on surveys that they completed as they kept their lists. They also had fewer complaints of physical ailments, exercised more, and were more optimistic. I was so impressed by this research that I decided to try it out on myself. For Lent I resolved to write down five things that I was grateful for every day. My “study” had an N of 1, and was totally uncontrolled, but I could experience it myself. Although I missed some days, I maintained the practice through the forty days, and recorded all the lists in my prayer journal. Did it help? Was I happier, did I feel better, did I exercise more? Yes. I think it helped. Sorry it’s kind of anti-climactic, but it’s hard to say what causes me to be happy or sad. What I can say is specific things that I noticed and experienced during this time of recording what I was thankful for. One of the first things I noticed was that I tended to think of friends and family more often than when I didn’t write down lists. That helped me to feel connected. Second I found that I was less likely to get stuck thinking about how terrible things are (I struggle with that from time to time). The practice of writing down what I was thankful for seemed to help my relationship with Melissa as well. These lists were not a silver bullet. They did not stop me from being discouraged or tired. I don’t know quantitatively whether I was happier when I counted my blessings, but it wasn’t a gigantic change. It also was hard to think of things to be thankful for. After a long day at work, I tended to have problems on my mind so it took effort to step back and count my blessings. For Melissa, and that she bought me an umbrella. For Anne that she reached out to me a while back. For Grandma Munly that she’s doing the family beach trip again. For the chance to go to these conferences which helps me to see that Spheryx is bringing something valuable. For the beautiful day and for the chance to see the mountains in the distance. These are all things that I could have easily missed. A lot of the items are relatively small like buying an umbrella or giving a call. But they reflect a love that helps to make my life meaningful. It’s a good feeling to remember these things. By itself I think that is reason enough to write down what I am thankful for. What is your experience with gratitude? Have you found it to be helpful? Is it hard to remain grateful? Is it possible or reasonable to be grateful in hard times? In case you are interested, I found a few articles about gratitude. Here is a good introduction to gratitude and some of it’s benefits. This article describes strategies for being more grateful. Finally, here‘s one about how giving thanks at Thanksgiving can be forced and how to make it more natural. It’s so cool that we can make a positive difference in our lives by just saying thanks. So this Thanksgiving let’s be thankful (without it being too forced)! This entry was posted in Uncategorized on November 21, 2015 by davidruffner. First of all what is Spheryx and what does it do? We are a startup company trying to commercialize technology from NYU for analyzing samples. The samples we’re interested in are suspensions: liquids with little microbeads or micro-emulsion droplets. These type of suspensions are in all sorts of things: household cleaners, cosmetics, and even milk. We use a laser microscope to get the size of these small particles with a technique called Total Holographic Characterization(TM). This technique is extremely precise, and it not only gives the size of the little particles but also gives information about their optical properties. That extra information is very useful for characterizing samples. We think it could open up a lot of new opportunities in all sorts of industries that use suspensions. If you want to learn more about the company and what we do, I recommend our website. It has a lot of information about the technology, press releases about progress we’ve made so far, and little bio’s about the team. One other cool thing that I mentioned to some of you, our technology was picked as one of Scientific American’s World Changing Ideas for 2014. The article is here. Also you can always ask me! I’m happy to talk about my work. 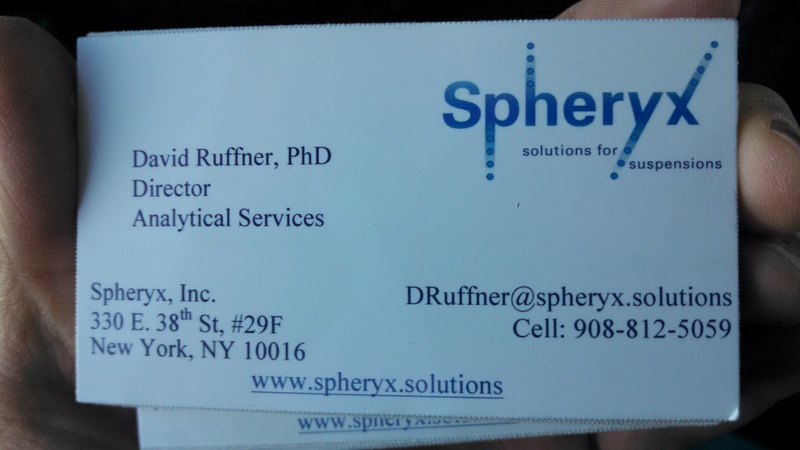 Technically I am the Director of Analytical Services and a Research Scientist at Spheryx. One of the benefits of working at a tiny startup is that they can give you a fancy title. I even get a business card. So far I’ve mostly been ordering equipment, moving furniture, and travelling. It’s a strange combination, but that’s what we need to do to make an analysis lab and to get customers. Luckily, we already had one of our fancy microscopes. David Grier, my thesis advisor and a scientific advisor of Spheryx, got one for Spheryx through a tech-transfer grant. But still there are all sorts of equipment from pipettes to desk lamps that you need to have a working lab. I’ve been working on ordering all those things. It’s coming together too! Last week I analyzed a test sample with our microscope and it worked. Next we need to get customers, which is where all the travelling has come in. So far I’ve made three trips: one to Proctor & Gamble in Cincinnati, another to the PittCon laboratory equipment conference in New Orleans, and most recently to the American Chemical Society conference in Denver. We presented about our technology on each of the trips, and tried to talk to people to see what type of particle characterization technology they need. The Proctor and Gamble trip was especially interesting because they are a big company and they are very interested in the technology. At both the conferences we got feedback that people think this technology has potential. Now we need to follow up on those leads! 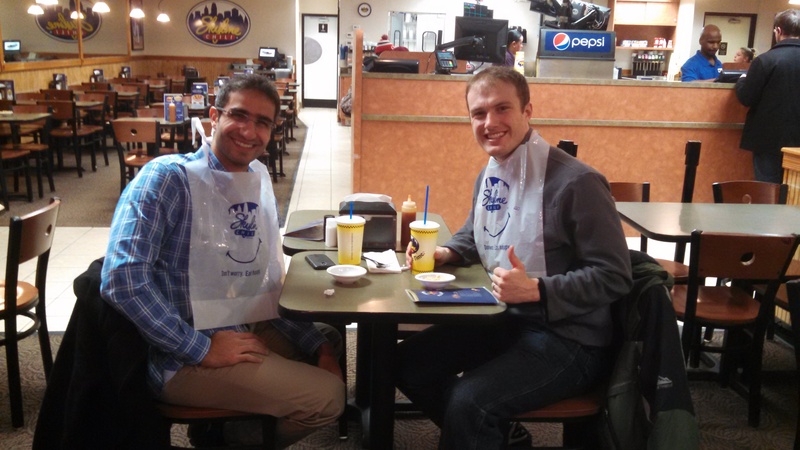 Having some Cincinnati chili with Henrique. It was yummy! 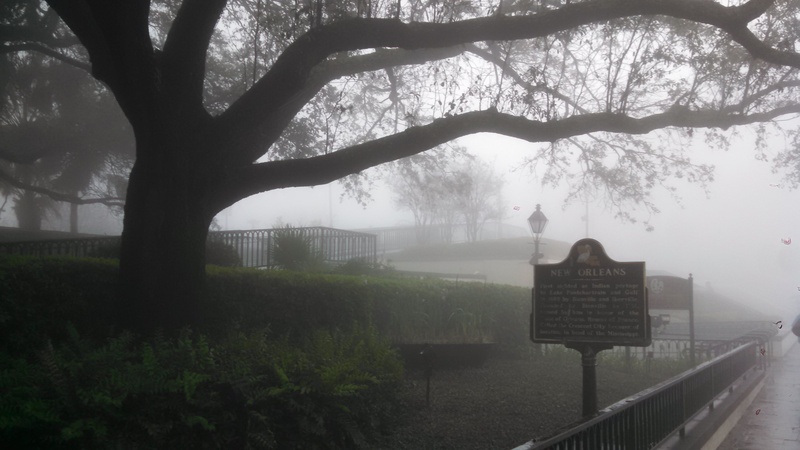 New Orleans in the morning with mist from the Mississippi. I went for a run and then had a breakfast of beignets at Cafe du Monde. 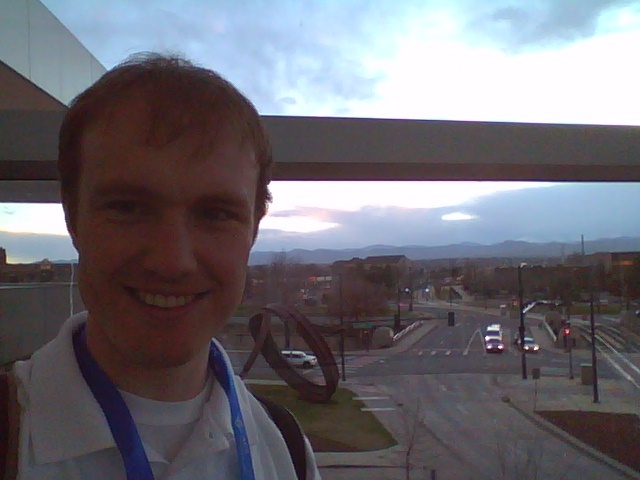 Me at the American Chemical Society conference in Denver with the mountains in the distance. This entry was posted in Uncategorized on March 28, 2015 by davidruffner. There is not much better than a beautiful clear sunny day. Today is one of those days. I have been able to enjoy it because I am off today. I actually took off this week and last week as a break between my PhD at NYU and starting work at the startup Spheryx. So I had the chance to go for a walk in the park and to take the picture at the top of the post. powerful influence over our sleep. That is very important for me because I hate the feeling of always being tired. But tiredness seems almost inevitable in our society. I’ll tell you today the story of my interest in darkness and my experience with how light and darkness affect me. I like looking at the stars so light pollution has always been an annoyance, however it was a POV film, The City Dark, that really opened my eyes to the problem. The documentary explores what we lose as a society when we no longer have a night sky. There is almost a spiritual loss because we no longer can see the world beyond our world. We lose our connection to something much bigger than planet Earth. There are all sorts of less obvious consequences as well. The artificial lights can confuse animals such as sea turtles. The newly hatched baby turtles often die because they crawl toward the twinkling lights of the city instead of the stars over the ocean. Most significantly for us, the lights we use can damage our own health. It seems that a lack of darkness can mess with our melatonin levels which can cause problems on many different levels. The documentary explains how our melatonin levels are normally low during the day and high at night. However if we experience light at night the melatonin levels can drop back down. This hurts our ability to sleep, but there is evidence that it can cause larger problems. The disruption of the melatonin levels can make us unhappy, overweight, and eventually lead to cancer as well. That was enough for me to start thinking about how light and darkness effect me, and I was experiencing some of these problems. When I moved to East Rutherford with Melissa after we got married, we had some light coming into the room at night from a nearby streetlight. I was able to sleep, but I didn’t really feel that rested even after eight hours of sleep. We decided to put blackout curtains up. Immediately we started to sleep more deeply. But without the bright sun in the morning, we had greater difficulty waking up. I was intrigued by how strongly the light affected me so I decided to sit by a bright lamp in the morning to try to wake up. It’s a little strange, but it really worked. After about 15 minutes I would feel ready to take on the day (the time wasn’t wasted either because I found it was a good time to pray). The light wasn’t a magic bullet. If I hadn’t slept enough, I would still feel tired, but it definitely helped ease the pain of waking up. 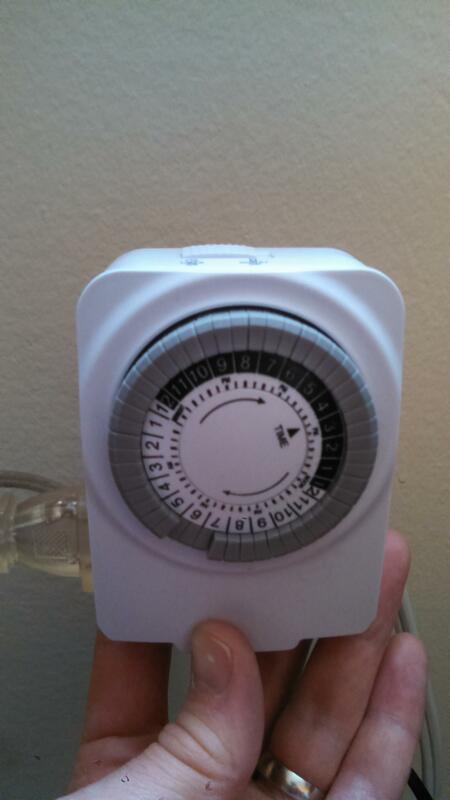 This timer is a cheap and simple way to control when your lights turn on and off. Recently, Melissa started working at Mt. Sinia Hospital and has to leave for work at 7:15am. Waking up so early in the dark is terrible, so I decided to get timers for the lights as a way to signal to our bodies that it’s time to get up. The idea is that if the light in the bedroom turns on a little before the alarm clock, then this hopefully gives your body time to ease out of the deep sleep. Melissa actually gave me a timer for Christmas shown in the picture on the right. With the lamp plugged into it, the timer can turn it on before we wake up. I immediately noticed a benefit from using the timer, but Melissa was not convinced. We were still tired in the morning, but I felt like the timer helped me to get up. A few days I forgot to set the timer and it was much more difficult to wake up. That difference convinced Melissa that light in the morning really can help with waking up. Moving forward I’m interested in working to improve the light and darkness in our home. I know that bright lights like phone screens are bad before bed so I want to try to cut those out. It’s really hard though because sometimes after a long day I want to read to unwind (or finish some work before I go to bed). What is your experience with light and darkness? Does it affect your sleep? Do you have it all figured out(please share your secret! ), or is it hard for you to get enough darkness at night? On the other hand do you get enough light during the day? I know that not getting outside affects me. Getting the right amount of light and darkness doesn’t solve everything but it makes a difference. I want darkness! This entry was posted in Uncategorized on February 12, 2015 by davidruffner. It’s been a while since I wrote here in my blog. The past few months I have been frantically working on my thesis, and I haven’t had time to think. Now I have a little break for Christmas and New Years before the final push to finish. I defend January 20th; the end is in sight! But now I have a chance to write about something other than optical forces in complex beams of light. I love science and I love my Catholic faith, but the interplay between the two is challenging to say the least. The stories in my faith are full of supernatural miracles that seem impossible from a scientific point of view. On the other hand science apparently fails to describe how I consciously experience life and love, and why I (sometimes) feel a connection to God when I pray. My questions surrounding these topics were reignited when I went to mass on December 8th for the feast of the Immaculate Conception. This church feast day centers on Mary, who embodies many of the issues between science and the Catholic faith. We Catholics believe that Mary, a human, was the mother of Jesus and thus the mother of God. This is a totally mind-blowing(or crazy!) idea when you think about it, and it raises tons of hard questions and problems. For instance, how could the infinitely powerful God “fit” in the finite body of a little human baby? Today, I’ll just focus on the aspect of Mary celebrated in the feast of the Immaculate Conception that she was conceived without Original Sin. In another words, Mary was miraculously preserved from the imperfections that cause the rest of us to have a tendency to do bad things. I remember as a kid thinking this was really unfair, but now my main issue is with Original Sin. What is this Original Sin? Original sin motivates the Christian story, and it is defeated through the life of Jesus. We believe that the world is broken and incomplete, which is actually pretty easy to believe when I watch or read the news. In Christianity this brokenness is explained by Original Sin, which is essentially the source of the dark side of our human nature. We believe that God became human to allow us to transcend this imperfect state. Jesus’ life of love and self-sacrifice opposed the dark side of human-nature. Naturally, this lifestyle didn’t go so well for him, and Jesus was killed. However, the good news of the Christian faith is that Jesus rose from the dead(another crazy idea! ), defeating evil and Original Sin, and showing us the way to a new and better life! But wait a second! Why would a loving God create a broken world in the first place? The answer I learned as a child is that God created a perfect creation and the first humans, Adam and Eve, brought in the darkness, death, and evil by sinning. We all know the story: God told Adam and Eve not to eat the apple so they ate it, and now everything has gone to hell. I never really liked this story because it makes God seem like a strict ruler instead of a loving God. Even worse, it totally goes against evolution. There was death well before there were humans (for example the T. Rex ate other dinosaurs). Furthermore there wasn’t an abrupt start to humans, instead we evolved from a common ancestor of apes and humans. Although it’s often thought otherwise, the Catholic Church actually endorses evolution, but I think there is still work to be done in reconciling our faith with our scientific knowledge. The Church teaches that the creation story in the bible should be viewed as a mythic story which imparts a truth about the world without necessarily having historical accuracy. But I have wondered for years how the story of the introduction of Original Sin, “the Fall”, could remain if there was no historical Adam and Eve? The question persisted so this break I searched online, and I found an article that provides an alternative viewpoint that I found very satisfying. Dr. Daryl P. Domning and Dr. Joseph F. Wimmer take on this issue in their article “Evolution and Original Sin: Accounting for Evil in the World ” from the Washington Theological Consortium. Domning also wrote a related article in the America magazine, “Evolution, Evil and Original Sin” (but I haven’t read that one yet). Their main point is that we should wholeheartedly embrace evolution, which they argue explains the origin of Original Sin in a richer way than the literal interpretation of the Adam and Eve story. I found the article very refreshing because the authors are not afraid to consider things that seem to go against the faith. Their article describes how the process of evolution itself leads toward a sort of selfishness that in humans we identify as Original Sin. Roughly, evolution works through chance and natural selection. Organisms reproduce with random changes or mutations, and then natural selection only allows some of those offspring to go on to reproduce. This process inherently favors those organisms that act in a way that ensures their own survival. If for some reason an organism acts opposed to its survival then it will probably not get a chance to pass that trait on. Domning and Wimmer argue that this mechanism is the basis for sinful behaviour in humans. However, Domning and Wimmer go on to describe how God gives all of creation great freedom through evolution, and that this outweighs the selfishness that naturally arises from the evolutionary process. Each organism, by living out its life, freely contributes toward creation. These contributions lead to the astonishing diversity of life on earth through the beautifully simple process of evolution. From this viewpoint, selfishness and Original Sin are side-effects of the freedom that God gave us. I find this viewpoint satisfying and empowering. First of all it makes me happy that it fits with evolution which I know to be true. But more importantly it helps me to come to terms with evil in the world. God only allows evil because he loves us enough to set us free! Now the Christian faith has even more meaning for me, because it reminds me that God did not abandon us in our freedom but sent his son to save us. Jesus gives us hope that we will be able to break free from our natural selfishness. I feel empowered because I feel that I have a role to play in creation. I can freely choose to follow Jesus and contribute to a new creation where love overcomes evil. I still have questions and things that I don’t understand about the faith, and about science. That’s OK. Asking questions and seeking to understand makes the faith our own and gives it meaning. I believe that God loves me and is happy when I seek to know Him better. I hope that this story of my grappling with belief encourages you to grapple with the questions about faith that don’t make sense to you. For my friends who aren’t religious, I hope that my story encourages you also in your search for meaning. Please comment! You’re perspectives help me to grow. This entry was posted in Uncategorized on January 3, 2015 by davidruffner. I don’t have the answers about what to do about ISIS. Here are some of my thoughts. What do you think? What should America do? People are dying. Iraqi Christians and other minorities are fleeing from the region controlled by ISIS, and many are being killed before they can escape. There were the two American journalists that were brutally executed, and many others. I feel that I should do something. If I was an Iraqi displaced by ISIS, I would want the world to care. I would hope that there are people ready to help the victims and stop the aggressors. On Wednesday President Obama declared that the United States will attack, degrade and ultimately destroy ISIS. On the one hand I’m glad that America is standing up against the violence of ISIS, and that it will help the countries in the region to defend themselves. On the other hand I have the sinking feeling that our bombs will only make things worse. I was surprised to learn that Pope Francis said that military action to stop ISIS could be justified. If there is anyone who loves peace, it’s Pope Francis. Here is a nice article about what he said: http://www.vox.com/2014/8/19/6032981/what-pope-francis-really-said-about-the-crisis-in-iraq. It’s worth reading the whole interview with the pope which is here: http://americamagazine.org/content/all-things/full-text-pope-francis-press-conference-plane-returning-korea. Sometimes force is necessary! But the pope made an important point, that countries need to work together to try to find the best solution to stop the aggressor. Maybe we can find a better solution than cruise missiles! One thing we can do is to support those that are helping the refugees. I think refugees make a huge difference. They weaken ISIS by physically leaving the area, and they strengthen the community united against ISIS. So when we are giving aid to refugees we aren’t just helping them, but we are undermining the ability of ISIS to destroy and harm. Catholic Relief Services is on the front lines in this non-violent fight: http://emergencies.crs.org/human-kindness-at-the-forefront-of-iraq-humanitarian-crisis/. My older brother Nathan sent me an article about how US soldiers were helping Iraqi farmers use greenhouses and irrigation. Things like this are great, because they enable people to create a better life for themselves. They are less likely to be influenced by extremist groups. Here’s the link: http://www.grit.com/departments/greenhouse-irrigation-iraq.aspx#axzz36vOWae9L. This article is actually from 2010, and since then that region of Iraq is partially controlled by ISIS. It’s easy to think that the program must have been a failure, but maybe it would have stopped the growth of ISIS if there had been more programs like it. What do you think? Is war part of the right solution? Do you have any ideas that could help bring lasting peace? Should we even worry about what is going on in Iraq and Syria or should we just worry about what is going on here? I’m looking forward to your answers. In the meantime I’m praying for peace! This entry was posted in Uncategorized on September 13, 2014 by davidruffner.